All machines convert one form of energy into another form—for example, a car engine turns the energy stored in fuel into kinetic energy. Those processes of energy conversion, described by thermodynamics, don't only take place on the macro-level of big machines, but also at the micro-level of molecular machines that drive muscles or metabolic processes and even on the atomic level. 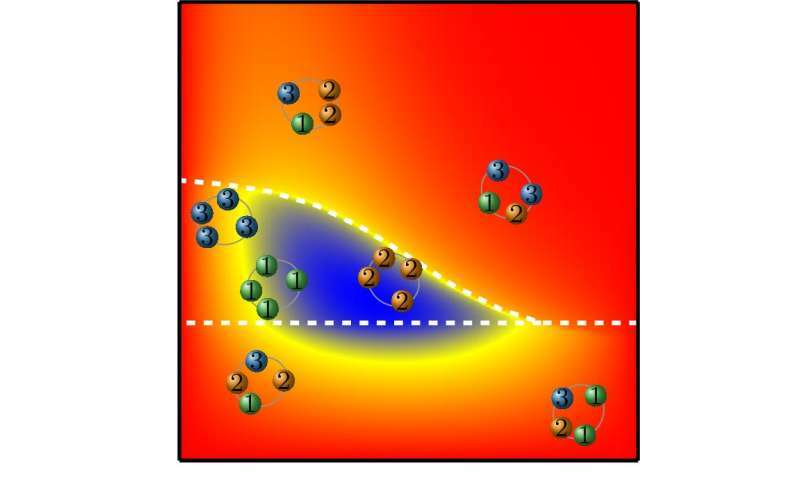 The research team of Prof. Massimiliano Esposito of the University of Luxembourg studies the thermodynamics of small nanomachines consisting of only a few atoms. In a paper published in Physical Review X, they outline how these small machines behave in concert. Their insights could be used to improve the energy efficiency of all kinds of machines, big or small. Recent progress in nanotechnology has enabled researchers to understand the world at ever-smaller scales, and even allows for the design and manufacture of extremely small artificial machines. "There is evidence that these machines are far more efficient than large machines, such as cars. Yet in absolute terms, the output is low compared to the needs we have in daily life applications," explains Tim Herpich, Ph.D. student at Esposito's research group and main author of the paper. "That is why we studied how the nanomachines interact with each other and looked at how ensembles of those small machines behave. We wanted to see if there are synergies when they act in concert." The researchers found that the nanomachines, under certain conditions, start to arrange in "swarms" and synchronise their movements. "We could show that the synchronisation of the machines triggers significant synergy effects, so that the overall energy output of the ensemble is far greater than the sum of the individual outputs," said Prof. Esposito. While this is basic research, the principles outlined in the paper could potentially be used to improve the efficiency of any machine in the future, the researcher explains.